Merle Wood & Associates is pleased to have the CASUAL WATER yacht for sale. A classic Feadship in every sense, she has been completely restored from stem to stern, and is ready for a new owner to take delivery. Built in 1987 by an experienced yachtsman, and refit in 2016, she has been meticulously maintained over time with no costs spared. Generous, stately accommodations are for 8 guests in 4 staterooms; a study converts to a stateroom bringing the total up to four. Merle Wood & Associates is proud to have the CASUAL WATER yacht for sale. CASUAL WATER represents another top quality, top pedigree mega yacht – this one from Feadship in Holland – joining our sales fleet. With a warm interior featuring dark wood and light, neutral soft furnishings, the CASUAL WATER yacht for sale features a spacious main salon with grouped seating to promote a social atmosphere. Forward lies a formal dining area, which features the same large windows that extend from the main salon. She also features an office/library that offers abundant storage, a plush white sofa, as well as a desk and chair that faces one of the windows. 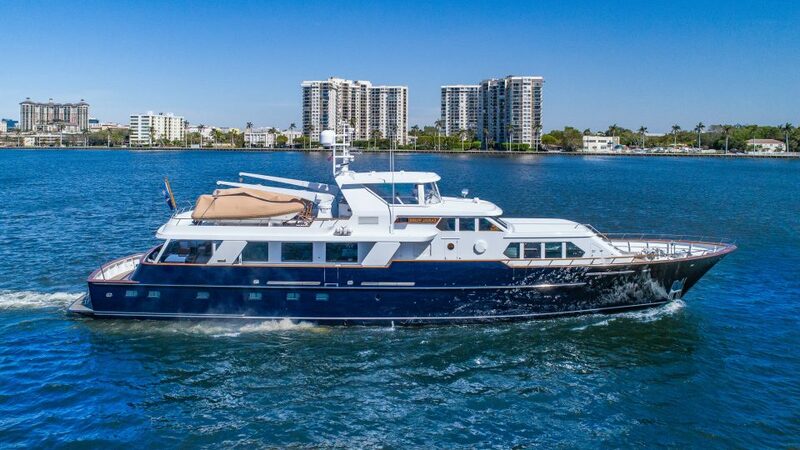 The CASUAL WATER yacht for sale features an aft deck that offers comfortable seating for 8, plus a full wet bar and steps down to the roomy cockpit. Up top, she offers a raised pilothouse with a full navigation station, and steps up to the flybridge, which features generous seating both port and starboard; this deck also accommodates her tender and toys. Consistent refits over the years have given her new, custom sunpads, new paint in 2015, as well as a new A/V system and a completely renovated galley. Reliable power is by 2 Cummins engines, offering a maximum speed of 14 knots, and a cruising speed of 11 knots, while her range at 10 knots is 2,800 nautical miles. For additional information, read the full CASUAL WATER yacht specs or view the CASUAL WATER yacht price and details. For information about the CASUAL WATER yacht for sale, or for expert knowledge from a qualified yacht broker, simply contact the luxury yacht brokerage firm of Merle Wood & Associates for assistance.